The LK 243 UnderSail project has now been completed and is off on the beginning of a new journey. The Bunk Box that was made and used onboard the Swan, is now the container for the complete exhibition which is due to start touring at the end of April. More info on that soon. 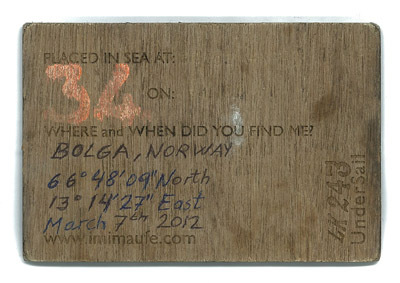 Part of the Swan residency involved putting 43 wooden postcards in the sea from Waterford to Halmstad. 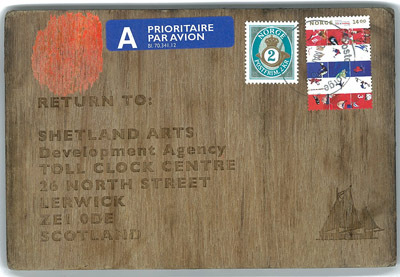 A book has been made about this part of the project and at the time of going to print 6 postcards had been found and returned. Now two more have arrived. Number 3 was found on Nethertown Beach, Near Carnsore Point outside Wexford, Irland and number 34 has been found a long way from where it started. Number 34 was dropped in the North Sea just outside Stavanger, Norway and was found on 7th March over six months later on an island called Bogla, which at 66º48.N is above the Arctic Circle! So keep searching those beaches, you never know what you may find!